Left to right: Communication freshman Clare McLaughlin, Bienen freshman Morgan Mastrangelo and McCormick sophomore David Gilbert rehearse for an upcoming production of “tick, tick … BOOM!” The musical, which will be performed this weekend, explores the idea of striving for success. For many Northwestern students, the desire to achieve certain markers of success looms large, said Communication sophomore Noah Watkins. 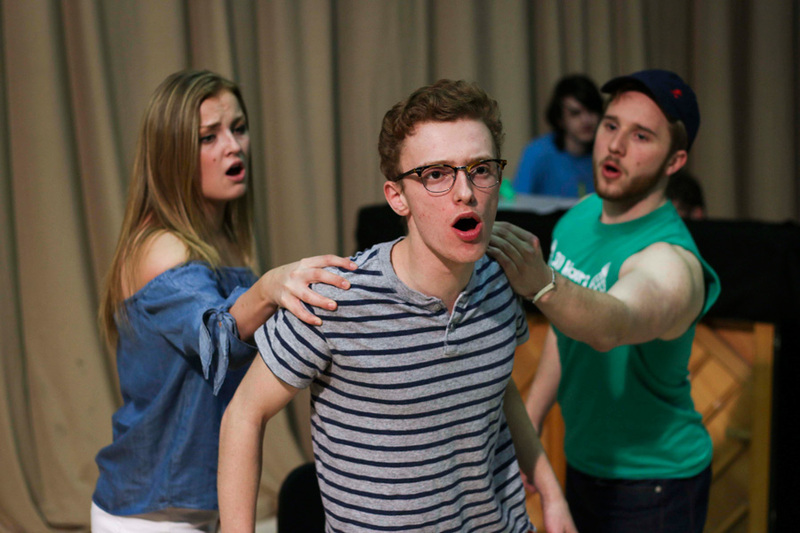 In an effort to explore this theme, Watkins directed a production of the musical “tick, tick … BOOM!” which opens Friday at the Mussetter-Struble Theater. The show, which is free, is funded by the Virginia Wadsworth Wirtz Center for the Performing Arts as part of the Struble Project Series. The show is a semi-autobiographical rock musical by “Rent” composer Jonathan Larson. Its plot centers on aspiring composer Jon as he scrambles to become successful before a self-imposed deadline of his 30th birthday. Producer Mary Olive Gauthier said she and Watkins chose the show in part because they felt the themes of ambition would resonate with NU students. The cast comprises three actors, Watkins said — an expansion from when Larson himself performed an early version of the piece as a one-man show. Each actor plays one of the three main characters, and two of them also take on several side roles. Often, Watkins said, the show feels like a rock concert, differing from most musicals in the way the songs fit into the story. The music itself is “real” rock with some ’90s influence, said cast member Clare McLaughlin, a Communication freshman. While the character Jon dreams about putting rock music on stage, the show does just that, creating an interesting parallel, she said. Though the show is ultimately a comedy, Watkins said he hopes audiences will connect with Jon’s struggle and enjoy the humor.